Home > Heavy Duty V Belts > V-Belts. A, B, and C Sections. Standard and Kelvar Construction > A-Section (Classcial) V-belts. 1/2" Wide > A48 Classical V-Belt. Consumer Brand. A48 Classical V-Belt. Consumer Brand. 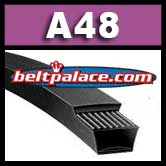 A48 Classical V-Belt, Consumer Brand. 1/2” Wide x 50” Length OC (13mm W x 1270mm L OC). Features polyester cord reinforced, superior compression section for high temperature and load carrying performance. Static, Heat, and Oil resistant. High quality for low cost! NAPA, Grainger, Ametric (low grade) A48. Campbell Hausfeld-Husky BT020400AV belt for air compressor. AX48 V-Belt. Classical AX48 Industrial COGGED V-Belt. 1/2" Wide, 50” Length OC (1270mm). Replaces Standard Raw edge A48, 4L500 FHP V-Belts.